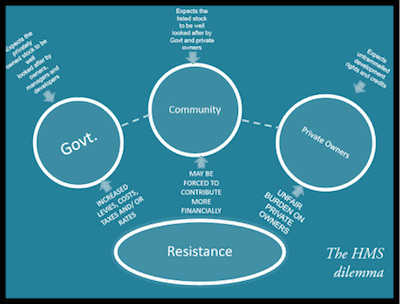 There is resistance in the NSW heritage management system inasmuch as listees question the veracity their listings, the community resists having to pay directly for the cost of the heritage management system (HMS) and the government (State and local) expects owners to look after their properties with nothing more than listings i.e. no education, promotion or celebration of cultural built heritage (CBH) in society. However, without government involvement, owners, managers and developers of heritage properties would take advantage and there would shortly be a natural attrition of the listed stock. Likewise, the community would resist having to directly contribute to the cost of running the HMS and associated taxes and levies would have to increase. The inbuilt resistance to change constitutes the 'HMS dilemma' and it is a sad and sorry tail that can only be fixed with cogent quantities of funding in order to make the system work better. The dilemma is explained in the above diagram. There is downward pressure from local government which expects private owners of heritage listed properties to pay for the upkeep of their properties without financial assistance or incentives for them to do so but there is an equal upward pressure from owners who not only expect that they be given equal rights to modify their listed properties equivalent to owners of un-listed buildings but that owners feel pinged by listings because of the unfair cost burden imposed upon them i.e. without assistance from the community that gets the benefit of the listing without having to contribute financially. Also, without assistance from government which claims that for reasons of subsidiarity, local government heritage management systems are underfunded and under-resourced. Similarly, the community expects that both private owners and the government will look after the listed properties, yet members of the community refuse or resist contributing financially to either the HMS itself or the upkeep of listed properties within the LGA (local government area) that they live in. On the face of it, local government would have to increase levies, perhaps charge more to administer the HMS and seek funds from State government to alleviate the cost burden. But it is unlikely that this will happen because of political considerations that conspire against the alignment of Commonwealth, State and local governments when it comes to sharing intentions and delivering upon them in unison. Perhaps the solution is to build into the HMS a series of non-financial incentives i.e. planning incentives whereby owners would be granted incentives that could be traded, sold or transfered on the market. If for any heritage reason that they cannot use the development credits on their own land, they could sell those credits or transfer them elsewhere. The recipient of the planning credit i.e. the transferee would then be able to exercise that credit on their own land – be it a heritage listed place, a place in a conservation area or a non-heritage listed place. Proof of actually conducting regular maintenance would earn further credits which in turn may be used, sold or transferred. The criticism against such a system is that councils would initially have to undercook development by lowering FSRs and increasing minimum landscape requirements thus forcing the trade and transfer of credits in order to progressively fill the shortfall. However, it is a system worth thinking about because it potentially meets every party's expectations i.e. owners of heritage properties in the LGA, owners of non-heritage properties in the LGA, members of the community which would see a lot more maintenance and beautification of properties in their LGA, developers who could accumulate credits for building on non-heritage sites as well as the alleviation of the cost burden on local governments.